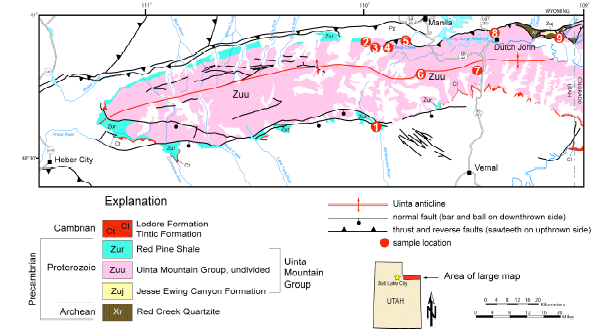 General geologic map of the Uinta Mountains showing sample locations (see accompanying figure. An amateur geologist negotiates the final miles of a dirt road to a Cambrian outcrop in western Millard County, Utah, that promises a rich zone of trilobites. Meanwhile, a geologist mapping on the San Rafael Swell walks across Jurassic limestone beds that contain a diverse assemblage of crinoids, ammonites, pelecypods, and echinoderms. Finally, a group of volunteers are helping a vertebrate paleontologist recover a dinosaur from the Cretaceous Cedar Mountain Formation near Arches National Park. Utah has long been known as a fertile area to hunt for all kinds of fossils – from marine invertebrates, to reptiles, to many species of mammals – because of its nearly complete and depositionally diverse sedimentary record. Utah’s fossil record has recently been extended to rocks older than Cambrian with the discovery of microscopic fossils in the Proterozoic Uinta Mountain Group. Most of the world’s oldest commonly known fossils come from rocks of Cambrian age (543 to 490 million years ago). Many of these fossils are already rather complex organisms that, by that time, had advanced through evolution to the level of brachiopods and arthropods. The older Archean and Proterozoic (Precambrian) rocks of the world were long thought to be barren of preserved fossils. However, paleontologists eventually discovered simple microscopic fossils in these rocks that pushed the appearance of life almost 3 billion years earlier to the Archean Eon (3.5 to 2.5 billion years old). For the most part, those organisms were very simple anoxic archaebacteria. In Proterozoic time (2.5 billion to 543 million years ago), living organisms diversified to include both prokaryotes (archaebacteria and cyanobacteria) and eukaryotes (algae, protozoans, and other higher organisms). By carefully recording the types of fossilized organisms and plant tissues they recovered from Proterozoic rocks, paleontologists have been able to subdivide the Proterozoic Eon into the Paleoproterozoic (Early), Mesoproterozoic (Middle) and Neoproterozoic (Late) Eras. Archean and Proterozoic rocks are well exposed in several of Utah’s mountain ranges, but until now, only a few microfossils had been found in these rocks and all were recovered from the Red Pine shale in the western Uinta Mountains. 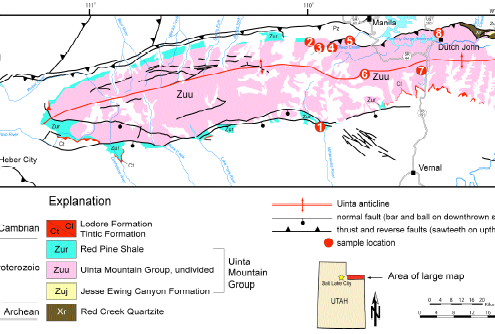 In the course of geologic mapping in the eastern Uinta Mountains, which was funded by the STATEMAP component of the National Cooperative Geologic Mapping Program, we sampled dark-gray and gray-green shale from the Proterozoic Uinta Mountain Group in hopes of recovering evidence of organic microfossils. Surprisingly, the samples contained the remains of microscopic life identified as species of cyanobacteria. What we found are likely Utah’s oldest fossils, possibly ranging in age from Mesoproterozoic to early Neoproterozoic (1.6 billion to 750 million years ago); pending radiometric data may help constrain their ages. These fossils also provide clues to the environment in which the organisms lived. Based on the fossil assemblages we have collected, the older lower part of the Uinta Mountain Group includes simpler forms of cyanobacteria that occur as filaments or single-celled organisms. They probably lived in a quiet, shallowwater, marine to marginal-marine environment. Higher in the section and later in time, we see changes in the flora that include species with more complex cell walls and with the ability to form colonies. These organisms are probably from a shallow but somewhat more marine environment. Some of these changes may reflect nothing more than varied environmental conditions or the degree of effective preservation. However, these changes may also represent evolutionary processes that were happening during early to middle Neoproterozoic time. The Uinta Mountain Group has been described as a thick (as much as 24,000 feet) sequence of metasedimentary rocks; however, we see little evidence of metamorphism in rocks exposed in the eastern Uinta Mountains. In addition, the presence of preserved fossil cyanobacteria suggests that these rocks were not metamorphosed. When viewed with a microscope in transmitted light, their color is a clue to their burial history. We know that the color of organic material in rocks changes from light brown to black as the rocks are buried and subjected to increasing heat and pressure; in general, the darker the color the greater the amount of heat that has been applied. The color of the organic material preserved in the samples we collected is medium to dark brown, which means that these rocks were not metamorphosed. This begs the question, how can rocks as old as Neoproterozoic and as much as 24,000 feet thick not be metamorphosed as previously thought? Part of the answer may be that the Uinta Mountain Group is actually less than 24,000 feet thick. Burial history modeling using the color alteration of the organic material in the Uinta Mountain Group as a guide suggests that the group is more likely about 15,000 feet thick. This is still thick, but much less than previously thought. Work continues to map the geology of the Uinta Mountains and to understand the rocks that comprise the Uinta Mountain Group. No doubt more fossils will be found in some of Utah’s oldest rocks.